Central Asia is an area divided between a number of Khanates which has long been a buffer region between the Holy Russian and Mughal Empires. Because they have not been taken over by Russia (or not for so long), and not suffered a Soviet Era, the people of Central Asia have suffered much less Russification. Thus most of the Central Asian Khanates retain many of their traditional ways of life [much more so than in the real world] and Central Asian culture is much stronger in Gurkani Âlam than in the real world. The most obvious signs of this are the brightly coloured traditional clothes of the people and the carved wooden doors of their homes. However, this retention of their traditional cultures has also limited their development due to a reluctance among their people to be involved in the static occupations necessary for industry. With the forcible elimination of slavery in the Khanates in 1842, many of them now rely on guest workers and expatriates, often from Persia or Ling China, to work in and run their industries. Many of them have significant natural resources; money from selling these (to both sides) helps fund them and keep them independent, and provide protection as neither side is willing to let the other gain exclusive access to their resources. In many Khanates the first home-grown technological development was that of havajahaz [airships] and vimanas [aircraft], with roads and railways coming later. Pilots from the Khanates have long been known as among the best and most daring on the face of the planet. In the Long War fighting between the Mughal and Holy Russian Empires swept back and forth across Central Asia many times, repeatedly devastating all of the countries there. Since the end of the Long War and the restoration of the Central Asia nations to independence the region as a whole is slowly rebuilding itself, although most of Central Asia remains scarred by old battlefields, barbed wire, minefields and unexploded munitions. Since then Central Asia has also been plagued by Uzbek terrorism as some of the Uzbek people seek to carve out an independent homeland for themselves, so far with no success. One of the larger of the Central Asian Khanates. Many of the Kazakh people retain their traditional horse-using nomadic way of life, despite the disruption of the Long War. However, they do use technology consistent with this, such as advanced camping equipment, radios and so on. Because of this adherence to their traditional way of life the population of the Great Horde of Kazakhs remains small relative to their size of the country. The Great Horde of Kazakhs were the first nation in Central Asia to form their own air force, using havajahaz [airships], in 1844. Their capital 'city' of Qyzylorda is really just a meeting place with a nominal permanent settlement. 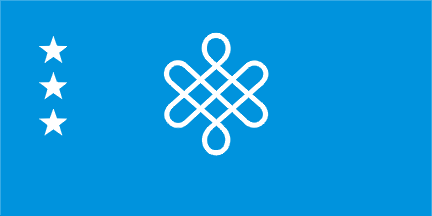 The flag of the Great Horde of Kazakhs is the traditional banner of the Kazakh Khanate, dating from 1456. The largest of the Central Asian khanates, the Great Khanate was formed in 1810 from the forcible merging of the Khanates of Tobyl and Irtysh with the Khanate of Atyrau into a single nation intended to unify all of the Kalmyk people and allow them to seek their greater destiny in the world under their leader, Ubashi Khan. As part of this the Great Khanate was the first Central Asian state to begin to industrialise itself, rather than simply use the industrially-produced goods brought from or donated by foreigners. This led to the Great Khanate becoming one of the major slave-owning states of Asia as the Kalmyks were unwilling to give up their traditional nomadic lifestyle in favour of life at a fixed industrial location, instead using slaves and other unfortunates to run their industry for them. Its industrialisation allowed the Great Khanate to pursue what Ubashi Khan saw as its destiny by invading its neighbouring khanates, overrunning them one by one in a brilliant show of ruthlessness, military skill and force which becomes known as the Harrowing of the Steppes, and incorporating all of the new territories and their peoples into the Great Khanate. The expansion of the Great Khanate came to end when an ageing Ubashi Khan, wishing to build up the Great Khanate to the point of being as great a power as its neighbours and one that would survive as a monument to him, attempted to invade the Mughal Empire in 1833, a course of action that led to the decisive defeat of the Great Khanate and its leadership in 1834. This in turn led to the assassination of Ubashi Khan at the hand of one of his sons, causing a vicious succession struggle, civil war, the secession of many of the nations it had forcibly incorporated into itself, and a sequence of weak and short-lived rulers. Despite the damage caused to it in the Long War the Great Khanate is still the most powerful of the Central Asian nations, but on an absolute scale remains weak, corrupt, under-developed and under-populated. The capital of the Great Khanate is the city of Qaraghandy [Karaganda], established in 1820. 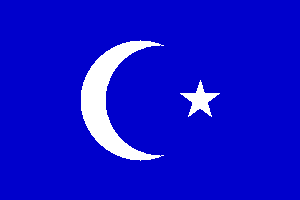 The flag of the Great Khanate consists of a white crescent moon and star on a blue field, not unlike the Ottoman flag, but with a blue rather than a red field. The Central Asian khanate from which the Great Khanate grew, Atyrau seceded from the Great Khanate in the succession struggle and civil war following the assassination of Ubashi Khan, the founder of the of Great Khanate, considering itself to have been ill-served by it. Since then Atyrau has produced no outstanding leaders, and with its small population it has evolved into little more than a buffer state, dependant on income from the Holy Russian and Mughal Empires to survive. The second Central Asian khanate taken over by the Khanate of Atyrau and from which the Great Khanate grew, Irtysh seceded from the Great Khanate in the succession struggle and civil war following the assassination of Ubashi Khan, the founder of the of Great Khanate, considering itself to have been ill-served by it. Since then Irtysh has produced no outstanding leaders, and with its small population it has evolved into little more than a buffer state, dependant on income from the Mughal and Holy Russian Empires to survive. A state established in 1688 in the west of the Fergana Valley in Central Asia by fleeing Uzbek refugees establish their own independent state. It is centred on the ancient settlement of Kokand [however, this Khanate of Kokand is very different to that of the real world]. Since then the khanate has balanced itself between the Mughal and Holy Russian Empires in order to survive, though it has also suffered punitive attacks and espionage from both empires. The capital of the Khanate of Kokand remains the city of Kokand itself. 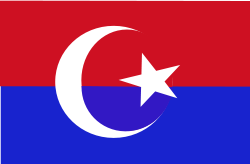 The flag of the Khanate of Kokand consists of a white crescent moon and star on a horizontally divided field which has a red upper half and a blue lower half. A Muslim Khanate in Central Asia which broke away from China in 1821 during the Zhengjiaotu Rebellion, and which has been able to maintain its independent existence since then with the help of the Mughal and Holy Russian Empires. Because of wars and other political shifts since the Khanate gained its independence, the actual city of Luntai [Urumqi] after which it is named no longer lies within the border of the Khanate, and its capital is now the city of Turfan. However, the people of the Khanate remain attached to the name, and the city, and so retain it. The first Central Asian khanate taken over by the Khanate of Atyrau and from which the Great Khanate grew, Tobyl seceded from the Great Khanate in the succession struggle and civil war following the assassination of Ubashi Khan, the founder of the of Great Khanate, considering itself to have been ill-served by it. Since then Tobyl has produced no outstanding leaders, and with its small population it has evolved into little more than a buffer state, dependant on income from the Mughal and Holy Russian Empires to survive. A Central Asian nation adjacent to the Caspian Sea, Turkmenistan has been an ally of the Mughal Empire since the late seventeenth century, although it has also always worked hard to maintain its independence. With Mughal assistance in terms of advice, money and equipment, the Turkmens have been able to take advantage of events in the region to take control of parts of Persia as well as the Khanate of Bukhara, and to resist attempts to take them over by the Persian and Holy Russian Empires. Unlike the other nations of Central Asia, the position of Turkmenistan and its close ties with the Mughal Empire enabled it to avoid much of the devastation of the Long War, a fact that it is now taking advantage of to increase its power and influence in the region. The capital of Turkmenistan is the city of Ashgabat [although this has the same name as the capital of Turkmenistan in the real world, the history of the place is very different to that of Ashgabat in the real world].